Hello! These are a few SNEAK PEEKS to the Birthday Kit! Creative Cuts and More is sponsoring the BELLI CHALLENGE! Come take a look HERE! We would LOVE to have you come take a CLOSER LOOK and if you love challenges join in the FUN! It's Noelle here, from VERY rainy Denver! I made this fantastic Standing Pop-Up Card! It was SUPER EASY! That is my kind of card! I stamped the Stampendous stamps in Chestnut Roan Chalk Ink and covered everything is Stickles! I used a strip of Killer Red Tacky Tape to put it together and tied a piece of ribbon on from my stash. It was that easy! I just wanted to let you all know we brought back the Holiday Treats Apron Recipe Album Kit for a limited time. When these are gone they are gone forever, we are working on new kits and won't be bringing this one back again. Hi, Lisa here! 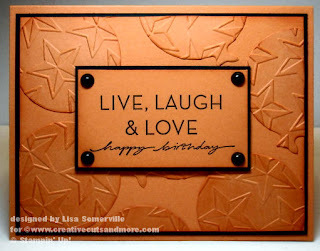 Today I have a quick CAS birthday card to share with you using the Balloon #01 Set from Creative Cuts and More. I only used the large balloons, saving the smaller ones for another project. I embossed the die cut balloons using the Big Shot and Stars Cuttlebug Folder, sponged the edges and embossed area, then randomly added them to Orange base card. 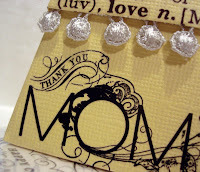 Trim off the areas extending past your card stock panel, sponge the edges, add a sentiment. Gotta love those 5 minute or less cards! Hello, this is Chris from Wisconsin! Today looks like it is going to be a gorgeous SPRING day in Wisconsin. I was in a pink mood when I made this little Gift Card and Envelope. You can find these adorable little Gift card sets at Creative Cuts and More! I loveCreative Cuts and More! There is a HUGE variety of die cuts, shaped cards and gift boxes made with HIGH QUALITY cardstock and MORE in a WIDE choice of gorgeous colors! Accessories: Dimensionals, button, Pink Gingham Ribbon, White satin ribbon, White gel pen, I used the small tag punch for the white tag to layer it! I hope you have a great day! Thanks for stopping by! Today I have a cute little Flourish purse to show you. I got this Tiffany Purse from Creative Cuts and More in an Almond Cream Bazzill Smoothies color. 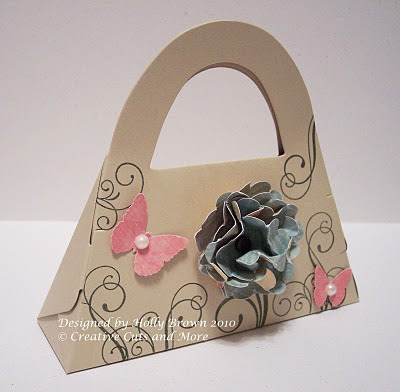 I stamped some flourishes around the purse to mimic flower stems and vines and then added a couple of punched butterflies to the scene. The crumpled flower is created by punching out four layers of a scallop circle, stacking them on each other, and then crumpling them up in my hand. This is such a quick and easy project when you need a little something to give to a sister or a girlfriend who might need a little cheering up. Stick a few little pieces of chocolate inside the purse or maybe a couple tubes of a favorite lipstick for the perfect little pick-me-up! 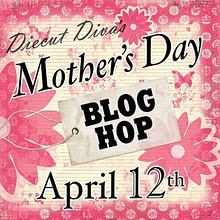 as we celebrate with a Mother's Day Blog Hop! for you to enjoy before you go through the HOP! You definitely DO NOT want to miss this!! From here you will to HOP on over to get more inspiration from the very talented Design Team! If for some reason one of the links is broken along the HOP do not worry, HOP back over here, to Die Cut Diva where the complete list will be. Enjoy the HOP! Thank you for stopping by! I really enjoy adding pictures to cards. 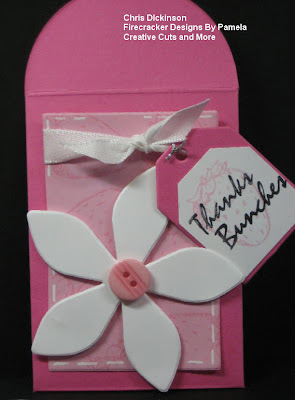 Here, I used the Shaker Card & 3D Shaker Envelope Set. A close up of the flower. I am hooked on these flowers cause they are so easy and cute! 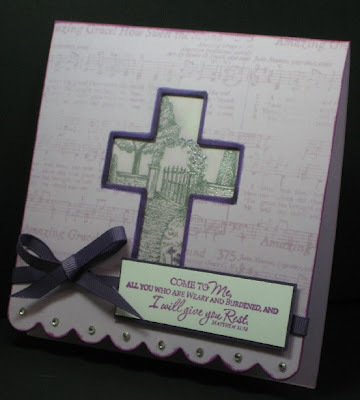 I used the Cosmo Cricket Early Bird line and was able to find bits and pieces of cardstock that worked perfect. Thanks for stopping by! We have a blog hop coming up so make sure to check back soon! 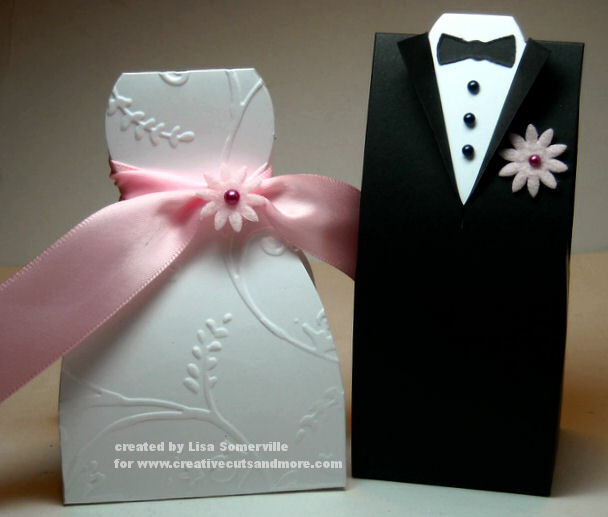 Hi, Lisa here and today I have some cute Wedding Favors to share with you. With the Wedding season quickly approaching, the Tuxedo and Dress Box die cut boxes make creating Wedding/Shower favors a breeze! I embossed the White Dress Box with the Cuttlebug Stylized Flowers Folder, tied on a pretty Pink Satin Ribbon and added a Felt Flower and a Basic Grey Half Pearl. To finish the Tuxedo Box, I simply added some Basic Grey Black Half Pearls and a Pink Felt Flower with a Basic Grey Half Pearl. 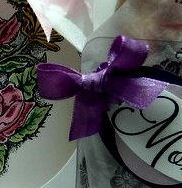 Creating these beautiful favors only takes a few mintues! Hello! This is Chris Dickinson popping in to say hello. I am currently visiting the beautiful state of Alabama but as you know hail from Wisconsin. I am loving the warmer weather here and have had a wonderful little vacation! Hey Paper Crafters, Steph Zerbe here. My little sister is having her first baby any day now!!!! I crafted a whole bunch of goodies for her baby shower. This is just one little part of it and the rest will be revealed mid April!!! 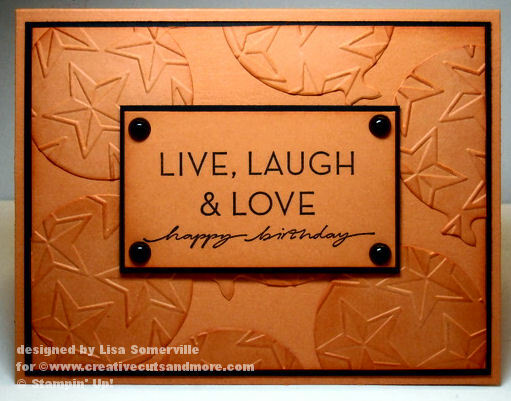 This is the Card Portfolio from Creative Cuts & More. This is a must have for any baby shower gift. Just fill it with 8 or so handmade, matching Thank You cards and envelopes! Add a ribbon tie to tame the BULK that just might occur if you add too many pop dots like I did. I stapled the ribbon to the inside of the side flap. 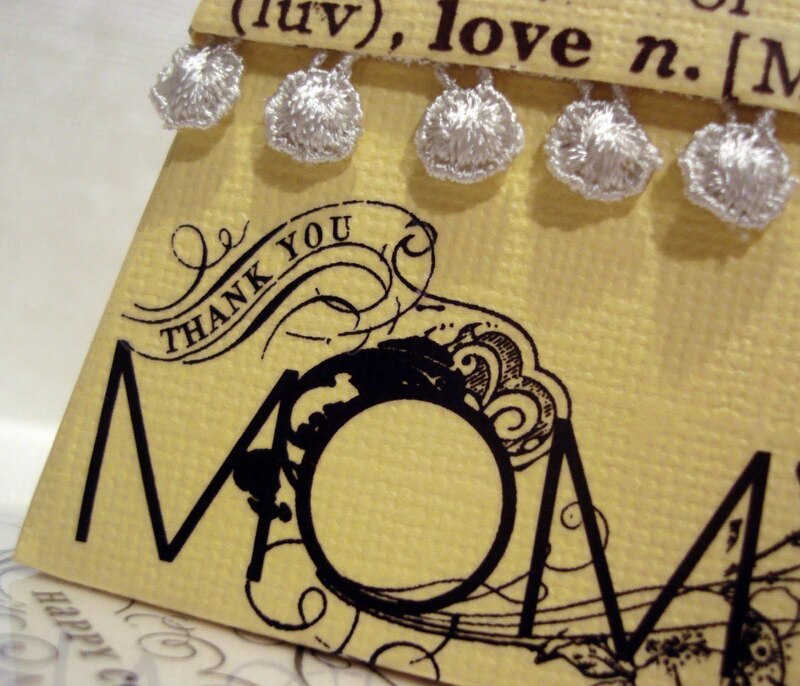 "Thank you for your baby gift" isn't that the perfect stamp for any mommy. Confession... I am terrible, I do not know where I got this stamp! However, the other stamps are from Papertrey Ink! Practical gift, right? I think so! Hey, don't get me wrong.... I sent my sister a huge package of other practical MUST HAVES like... like, a bottle scrubber, a bottle drying rake, a TO GO changing pad and wipes holder, TV button guard, bath essentials, etc. You could use this Card Portfolio for many , many different reasons.... order yours in any color and texture that we offer!!!! Be sure to stop by as often as possible to see new samples, challenges and giveaways!! !